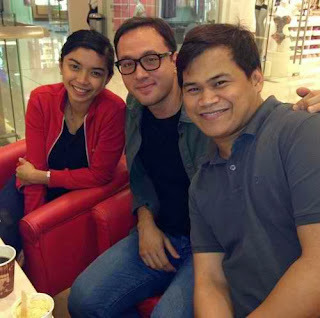 Director Lino Cayetano and Volleyball star Fille Gainglet is going to wed this December 2013. The news was first posted on Showbiz commentator and radio announcer Ogie Diaz. Though the wedding date of Lino Cayetano and Fille Cainglet was not shared and the full list of guest, sponsors and celebrities, politician who will come to the wedding. But still so many people are excited for the wedding ceremony of the Lino Cayetano and Fille Gainglet. Lino Cayetano is the younger brother of Senator Pia Cayetano and Alan Peter Cayetano while Fille Gainglet is a volleyball star and 12 years younger than Lino. Here's a photo of the Lino and Fille with Ogie Diaz courtesy of fashionpulis. The video of their wedding for sure it will not be shared immediately online so we just have to wait and keep visiting for the updates here.